The Route des Grandes Alpes starts on the shores of Lake Geneva and crosses 16 of the highest French passes continuing all the way to the Mediterranean Sea. Over 700 kilometres (+400 miles) and almost 15,700 metres (51,500 feet) of vertical climb. The official website in multiple languages is here. This summer I will ride a week long cycling tour broadly following the Route des Grande Alpes. A trip organized by my friend Leslie that will include people from the USA, Canada, France, Turkey, Germany, and Switzerland. Our Tour has two main deviations from the official route. First: On day one we will skip the first 30 or so kilometres from Thones and instead start in Morzine. This avoids a relatively busy boring stretch. We will then do a long-cut around the minor and uninteresting Col des Gets (1,170 metres)and climb the legendary Col de Joux Plane (1,691 metres) – a frequent Tour de France climb in recent years including the miracle Landis day in 2006. Near Taninges, we will rejoin the official route. Second, we will finish the tour in Barcelonnette. Instead of reaching the Mediterranean, we will spend three days cycling in one of the best locations in France for beautiful climbs. See Barcelonnette – Cycling Paradise for more. Here are detailed stage descriptions with maps and photos of the upcoming July 2008 Lost Boys Tour d’Enfer. Col de la Bonette, Col d’Allos, Col de la Cayolle, Sainte Anne la Condamine, Col de Vars (south side), Col St Jean, Col de Pontis, etc. Next Article The 2008 Dauphiné Libéré Gets Steep! That is so great… I’m going to have to retire early so I can ride this route some day when I’m still in decent shape. Unfotunately, I’m just going to miss Leslie this weekend here in the states. He’ll be in Virginia and I’ll be over in the mountains of Western NC… we were so close to getting together for a training ride. That is so great… I’m going to have to retire early so I can ride this route some day when I’m still in decent shape. Unfortunately, I’m just going to miss Leslie this weekend here in the states. He’ll be in Virginia and I’ll be over in the mountains of Western NC… we were so close to getting together for a training ride. 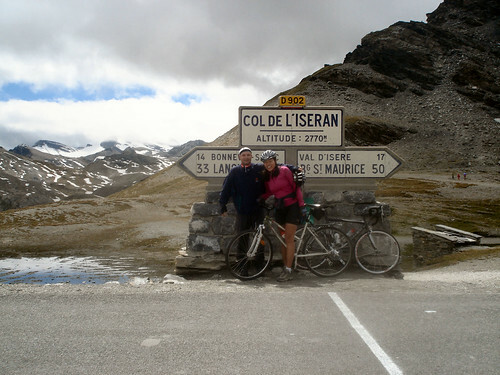 anyone doing the route des grandes alpes july or aug 2010? I’ve done it in september 2012. It was an amazing experience!